For nine years each spring, we’ve walked down the “New Road” that follows the far side of the steep valley that holds our pasture. And every year, we’ve seen the same small tree that every year, we think a tree thus disfigured surely will not be back the next. But it is. 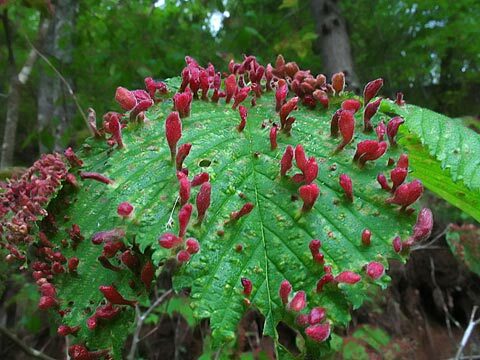 Regular as clockwork, the leaves come out in the spring, and they sprout these odd red tumors (each containing tiny insect babies.) It is grotesque, and I’m always curious about it. I don’t think I’ve bothered to take pictures until this week, though. I would have said, off the top of my head, that this was the work of gall midges–small mosquito-looking flies that deposit their eggs in plant tissue. Then, depending on the unique chemistry of the species, the growing pupae release a chemical into the flower, stem, or bud and a charateristic plant response–different for each species of midge–produces a ball, spindle, spine or other thickening called gall. Hence, the insects babies wave their chemical wands, and a protective shelter swells around them, made of food! I can’t find a picture of just this particular gall associated with midges. There are other sources for galls (see Waynes Word for instance) and if anybody out there has the *gall to tell me, I’d be interested to know the source of these ugly red pustules on this poor plant that seems to be unperturbed by its hideous warty leaves each spring–a kind of commensalism where one member (the midge, or who-ever, benefits, and the other member is apparently not harmed). * I can find no relationship between this plant gall and “of all the gall”, the latter related to a very old word for bile (think “gall bladder”) , implying bitterness and hence vexation, annoyance, malice and spite. Some galls might be gall bladder shaped, hollow inside, green of course, and hence the origin of the name. Dunno. Anyone? 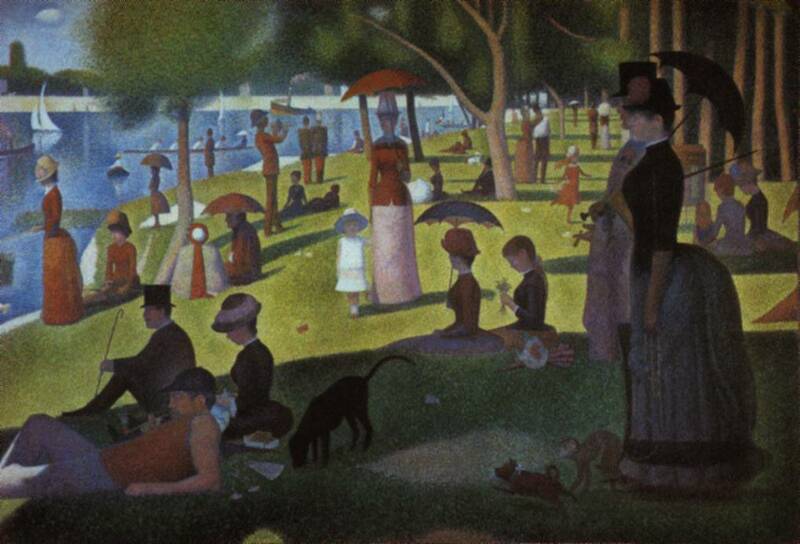 The image is actually quite wonderful, setting the imagination to wandering, from Seurat’s “Un dimanche après-midi à l’Ile de la Grande Jatte” — http://www.ibiblio.org/wm/paint/auth/seurat/grande-jatte/seurat.grande-jatte.jpg — to a developer’s subdivision of former farm fields. I think your tree might have eriophyid mites, which produce those characteristic red galls on tree leaves. The galls are unsightly but don’t seem to harm the tree. Ironically I can’t seem to find a reference for these critters here in our Entomology department at Virginia Tech. Thanks for this, let me know if you find links to images (of mites or their galls–hadn’t known mites produced galls!). Much appreciated. I’m going to see if I can figure out the tree too, as it is not one I know offhand. Failing that, may post a better picture of leaf only to the blog, please sing out if you can ID it! No idea what it is, but it puts me in mind of a short story I recently read, “The Golden Helix” by Theodore Sturgeon, which inverted my understanding of evolutionary theory. Here’s my take on it, etymologically speaking. Gall being vexation or irritation certainly applies. The plant is stimulated to form these odd growths as a reaction to the irritant of the insect ovipositor, no? One writer likened it to a kid getting to live in a candy store. Always fun, these odd growths. Nice photo too! The lovely rose color and the photogenic angle of your shot made the words “ugly red pustule” seem very inapplicable! You just can’t take an ugly photo, Fred!